CR-133. Mikhail Voskresensky. Mozart. Piano concerti, vol.6 (concerti no.5, 11, 18) - Classical records - compact discs with classical music, CDs online shop. Mikhail Voskresensky is one of Russia's leading pianists. He is the winner of four international piano competitions (Schumann in Berlin, in Rio de Janeiro, George Enescu in Bucharest, and Van Cliburn in Fort Worth, Texas). In 1966 he was honoured with the Merited Artist of Russia award and in 1989, the People's Artist of Russia. Mikhail Voskresensky has extensive concert experience. His performances has been recorded and issued on more than 50 CDs. His performing art is well known and favored by the audiences worldwide. He is the only pianist in Russia to perform all of Chopin's piano compositions during one concert season (in 1982-83, in nine recitals in the Maly Hall of the Moscow Conservatoire). Mikhail Voskresensky graduated from the Moscow Conservatoire where he studied under Ilia Klyachko, Boris Zemliansky, Yakob Milstein, Lev Oborin (piano) and Leonid Roizman (organ). As student of the famous Lev Oborin, the winner of the First Chopin's Competition in 1927, Voskresensky adopted his teacher's refined romanticism, and perfect taste in harmony with the piano's splendid sound. The images evoked by his playing suggest contrasting musical colours, never out of harmony, with a charming legato inducing the instrument to sing. "His playing fascinates audiences with its artistry, cordiality and ingeniousness. Mikhail Voskresensky is a very talented and intelligent musician", Oborin wrote about his pupil. Voskresensky's repertoire includes Beethoven's 32 sonatas, all works of Chopin, and 64 piano concertos. He has performed with orchestras under the direction of more than 150 conductors, among them - Charles Dutoit, John Pritchard, Franz Konwitschny, Kurt Masur, Eugeny Svetlanov, Kirill Kondrashin etc. 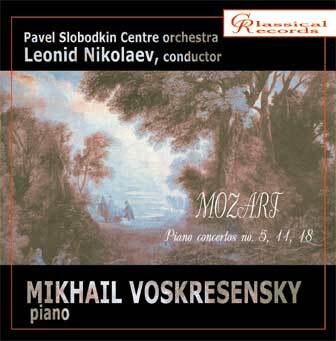 Since 2007, he is involved in a project of recording all Mozart piano concerti with Pavel Slobodkin Centre Symphony orchestra in cooperation with the conductor Leonid Nikolaev. On this CD, the sixth in this cycle, Concerti no.5, 11, and 18 are represented (recorded live from a concert in Maly Hall of the Moscow Conservatory on March 19, 2009). Mikhail Voskresensky began his pedagogical activities at the Moscow Conservatoire in 1959. For 8 years, he was an assistant to Professor Lev Oborin; since 1963 he has his own class. At present, Professor Voskresensky is the Head of piano chair at the Moscow Conservatoire. His pupils have won 112 prizes in international competitions, among them 49 gold medals. He has participated as juror for many major international competitions. He continues to be Chairman of the Jury for the Scriabin International Competition in Moscow. Mikhail Voskresensky is the President of the Scriabin International Society, and Guest Professor in the Toho Gakuen School in Tokyo. Professor Voskresensky gives numerous master classes in Russia and abroad. Leonid Nikolaev studied at the Moscow Conser-vatoire with Boris Khaikin and Aron Shereshevsky. He was on special course in Vienna with a famous conductor Hans Swarovski. In 1974, he won Grand Prix of Herbert von Karajan Fund at the International Symphony orchestra competition in Berlin. Together with Leonid Slatkin and Zubin Mehta, he was the principal of the Russian - American International Youth orchestra from the moment of its creation in 1988. He recorded many CDs with music of Tchaikovsky, Beethoven, Berlioz, Shostakovich... Together with Mikhail Voskresensky, he recorded 2nd Piano concerto by Chopin with Great Radio and TV Symphony orchestra. He appeared in all European countries, in Cuba, USA, Japan. He was a professor of the Moscow Conservatoire. Leonid Nikolaev suddenly died on July 26, 2009. Do you have any questions about CR-133. Mikhail Voskresensky. Mozart. Piano concerti, vol.6 (concerti no.5, 11, 18)?